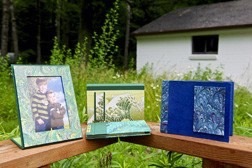 Claudia Squio has some wonderful tools for boxmaking and books. She works mainly with fabric over board and has some lovely journals, and unusual boxes on her website. Look for her cartonnage tool kit, complete with corner cutting tools and took case, plus her unusual and original designs are a real inspiration She sells kits as well as creating lessons online. She also has a blog and an etsy shop. This is one creative and interesting lady! Her online videos are excellent - you feel like she is right there with you, informing you, and cheering you on! Get a copy of her book too - packed with photos! Nice people and good selection of paper and USArtQuest art supplies. Owner Nancy Morains has a remarkable website full of treasures for book arts. Great service, fine prices, terrific tools and treasures for traditional European Marbling and suminagashi as well. people. Get on their mailing list! • Chiyogami/Specialty Paper LCI Co.
Several Chicago sites –many others across the US. Great stores, super website,online instructional videos, tools, papers, bookcloth,PVA, plus kits. Extremely nice staff, good selection of papers, tools. Beautiful variety of papers, great blog, free online instructional videos, very accommodating. Good variety of papers – some excellent links! • Cutting mats, tools, glues, etc are available from the normal sources, like Michaels, Walmart, Target. Incredible source of tools and materials – great papers too! Especially if you can find one of their stores close to where you are! 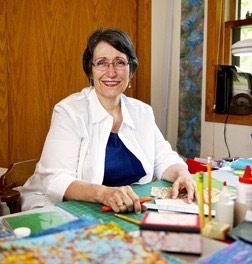 Another Great Marbling resource is Heidi Richenbach Finley, who is based in Michigan. She not only teaches classes in marbling, but as an artist herself she has created a line of paints and other marbling supplies, including a great kit, that is worth looking at. Her colors are vibrant and her manual with her Serious Beginners Marbling Kit is excellent. Take a look on YouTube for her videos and at her etsy website for marbling supplies. A Bit of Press . . .